On April 22, 2013, more than a billion people in 192 countries celebrated Earth Day, an annual event aimed at increasing awareness for, and preservation of, the world’s natural environment. Over the last 20 years, LSG Sky Chefs has done its part to develop and implement an environmental management system that is today considered the most structured and expansive in the in-flight services industry. It provides for continuous improvements and performance measurement within our global network, and the implementation of a new set of sustainability initiatives each year. These range from building new energy-saving catering units to designing lighter equipment; installing eco-friendly freezers and lighting systems to enacting programs that save water, waste and energy. 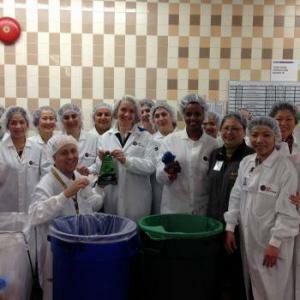 One such program at our Seattle-Tacoma International Airport flight kitchen has diverted 20 tons of waste per month thanks to a simple food-scrap composting idea put into action. The savings amount to approximately nine percent of our total waste there. The initiative was honored by the Port of Seattle Commission at its 2012 “Green Gateway Environmental Excellence Awards”, where LSG Sky Chefs was one of three airport tenants to receive this top award for environmental performance. German Christmas Markets in Texas?